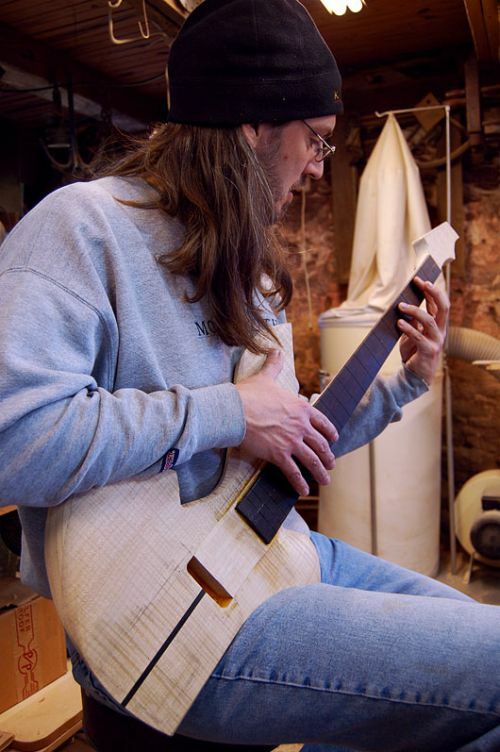 Rick Toone is at it again showing significant progress on the Orchid Bass guitar we last looked at it in Toone Guitars’ Orchid Bass. The guitarist sits relaxed but upright reducing stress on the torso and particularly the upper back. 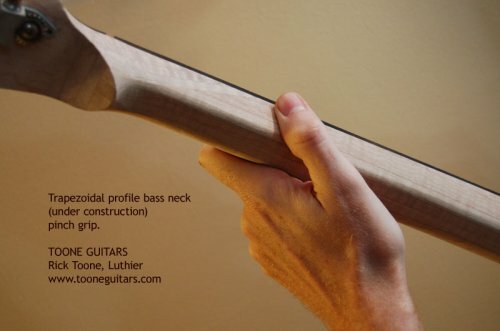 The guitar neck sits at a 45 degree angle because of the bass design and not in spite of it. And, the bass sits in playing position without the need for a footstool. Why is this important? Because raising the foot puts stress on the lower back and can lead to pain and musculoskeletal disorder (MSD). And if you recall, this bass is being built for a woman bassist so Rick has accommodated a woman’s body by sweeping the body away from a woman’s chest and then sweeping it back out to still provide excellent support for the picking arm. Finally, the bass’ back is contoured to fit ribs and hip. 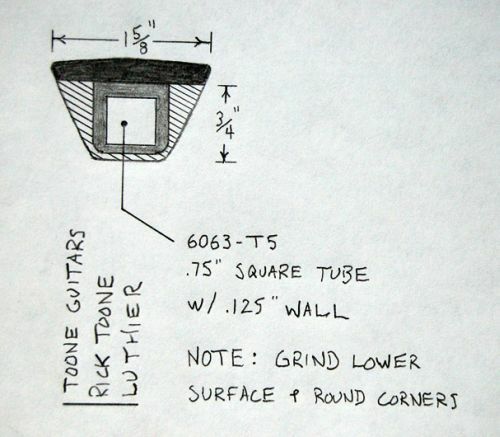 Fortunately, Rick isn’t the kind of luthier afraid to try new things and I’m looking forward to reading about his findings with this unusual neck design. 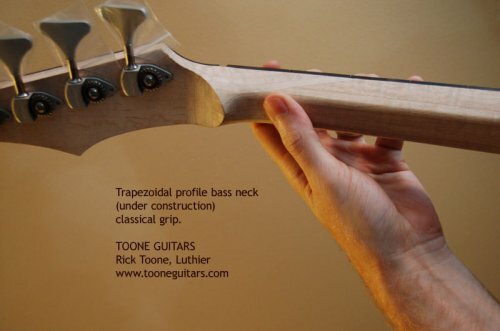 For now, you can read more about the radical neck profile in Rick’s article Trapezoidal Neck Profile. One of the things that I like about the approach to this design is that it treats the bass guitar as an instrument of its own accord and not as a specialized version of an electric guitar. Another thing that I like is the attention given to gender issues. I have long felt that most female players look awkward (i.e, they don’t look comfortable) playing conventional basses and guitars–I suspect because the instruments did not evolve with the influence of female physiology. Gender issues may actually be an interesting chapter in the discussion of ergonomic guitaring. Hi Meter – We’ve not seen gender issues addressed in any of the designs we’ve looked at before so the Orchid is truly special in this regard. Fortunately, Rick is an adventurous and thoughtful builder. Very Interesting design. But how does it sound? Hi Andrew – That remains to be seen since it’s a custom design, the first of its kind and still a work in progress. That said, I expect Rick will share a great deal more as the Orchid approaches completion. I love the body design. I think its very innovative. I also looks better in person (so to speak) than I thought it did in the previous drawing. I’m not sure how I would feel about the trapezoidal neck however. It may be a great addition, but it looks to me like it will be uncomfortable. It’s a huge leap forward from the template to its current state but I had the benefit of seeing another example of Rick’s highly sculptural approach. The results of the trapezoidal profile neck remain to be seen but I trust that Rick will keep us in the loop on the design. Today it dawned on me that there is a superficial resemblance between the Orchid’s trapezoidal neck and the 1950’s Fender Telecaster V-neck profile: they are both based on non-curvilinear geometries. However, I had always assumed (or maybe I read it someplace) that the V-neck profile was done to make manufacturing easier rather than out of any ergonomic concern. Does anyone know anything definitive about this? Interesting note, Meter. I don’t have any insight on that at the moment but maybe one of our other readers does? Meanwhile, I’ll see what I can dig up. I found this: Vintage Tele V-neck Experience. While it doesn’t answer *why* Fender went with a V-neck, it does suggest that it works better for some people. Let’s see if this analogy makes sense. I’ve played V-necks and they are somewhat similar to the trapezoid…but my fret-hand thumb feels like it’s trying to balance on a marble. My impression after playing the trapezoid was that my fret-hand thumb liked having a parallel surface to the fretboard. More leverage. The flat back also serves as a nice orienting guide. I will say the trapezoid neck is very difficult to make. It’s a much more complex shape…because it tapers. Even with a template and calipers, I held my breath the entire time I shaped it. I wanted the wood solid but minimal around the aluminum, so the neck would be as small as possible for a young woman. In an article I read a while ago Leo Fender said that he had a new person work on necks, who basically did a bunch of them wrong. I don’t remember how they ended up on production guitars, but he commented on how he thought it was funny so many guitarists ended up liking them. So you’re right that ergonomics were never a consideration with the v-neck design. But I think it looks like the trapezoid neck could be very comfortable. I did a string-up of Orchid yesterday, to tweak the hardware fit, pre-finish. Played it acoustically for an hour or two. My impression of the (unplugged) sound: bright and clear yet warm and organic. I will report in detail, shortly. Thanks, all, for your interest in this project…especially Robert, for hosting the show. Making progress toward a Christmas (promised) delivery. the aluminum truss bar is a good choice, the headless electric i made has rust stains coming through the back of the neck due to the choice of a mild steel hollow section bar, i guess the wood was moist enough to cause the corrosion. it is only cosmetic. it is a lovely organic bass you made! So far pleased with aluminum. I’ve experimented with stainless steel…but it’s very heavy. I’m excited most, though, about titanium. I built a neck earlier this year with side-by-side 3/8″ titanium tubes and it is incredibly light weight, stable, and resonant. I will be using that technique more as well. Titanium is very expensive ($400-700 raw materials for one neck) so it will appeal to clients with fewer budget restrictions. More reports soon as final assembly is tomorrow. I have a fully squared neck profile on my Selmer Maccaferri copy. It is very comfortable to play on a totally flat back surface over a thick neck.